The ruling administration is yet to respond to a poll which claims that there has been a decisive swing among voters and they are now in favour of the opposition New National Party. Against the background of widespread speculation surrounding the outcome of the 19 February General Election in Grenada, CADRES conducted a survey of public political opinion there between the 18th and 21st of January 2013 in all fifteen constituencies. The survey. according to a press release from CADRES was designed to gauge the national mood, and employed a methodology similar to that which has been successfully employed by CADRES across the region. Since the survey was conducted after Parliament was dissolved and, indeed, after the date of the election was announced, it would capture the contemporary mood of Grenadians and is likely to be a good indicator of the voting intentions of Grenadians upcoming election. “The major political finding of the survey is that there has been a decisive swing against the governing NDC which CADRES measured at 11%,” said the release. “The opposition NNP is the sole beneficiary of this swing away from the NDC and this demonstrates that the two-party political conversation is still very much a reality in Grenada; it further indicates that the NDC off-shoot the National Unity Front (NUF) has not at this time stimulated the political interest of Grenadians,” it elaborated. The projected 11% swing towards the NNP needs to be placed in the context of the previous (2008) election when the swing against the NNP was -0.4% but was significant enough to cause its defeat. On this occasion the political pendulum has swung in the opposite direction, and it would appear as though Grenadians will return the NNP to office with a majority that is more generous than that which it enjoyed before the 2008 election. The poll also illuminated the basis of Grenadians political opinions at this time, and it is clear that their current primary concern is with matters of an economic nature. The single largest quantity of persons in the survey (48%) were most concerned about the Cost of Living at this time, while a further 23% are concerned about Employment and 15% about the Economy. Cumulatively it can be seen that 86% of Grenadians are preoccupied with matters of an economic nature at this time and have presumably cast blame on the Governing NDC for these problems in much the same way that governments have been held accountable regionally and internationally for the recession. Consistent with this view, some 49% of Grenadians polled indicated that they believed that Grenada was currently on the “Wrong Track”, with 25% believing the country to be on the “Right Track”, and the remainder (27%) declining to answer the question. Although this broad preoccupation with economic matters appears to be largely responsible for the swing away from the NDC, the poll also speaks to other related issues and one such issue is the extent to which Grenadians have confidence in the governing and opposing political parties. At this time, 30% of Grenadians still repose confidence in the NDC, while 49% have confidence in the NNP to run their affairs, which suggests that Grenadians do not believe that the NDC has the capacity to help them navigate these tempestuous economic waters. Another political indicator that always generates interest is the question of leadership, which CADRES measured from several perspectives. 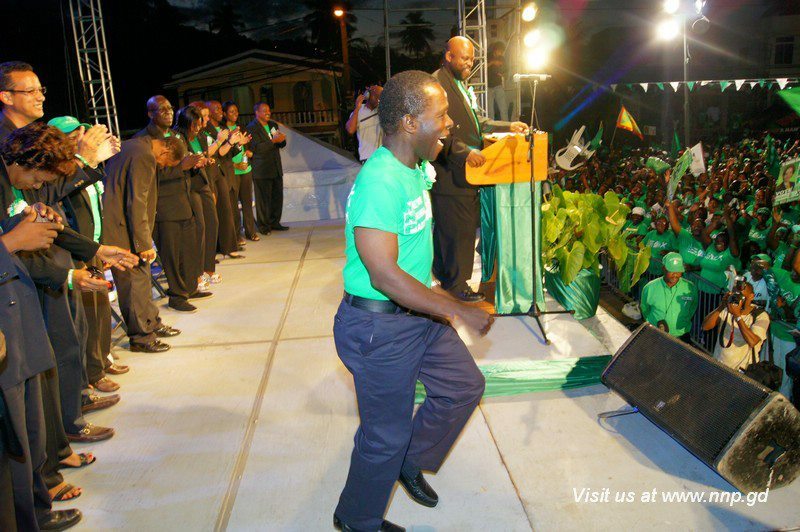 Critically, the survey found that 57% of Grenadians would prefer Dr. Keith Mitchell to be their Prime Minister, while 33% would prefer Mr. Tillman Thomas to remain as Prime Minister. In addition CADRES asked respondents to “score” the two leaders on a scale ranging from “1” to “10” as it relates to Competence, Integrity and overall Likeability for leadership. In this regard Dr Mitchel outperformed PM Thomas in all three instances, scoring 7.5 versus 6.0 for Competence, 6.7 versus 6.3 for Integrity and 7.1 versus 6.2 for overall Likeability. Certainly these scores buttress the argument that in Grenada performance appears to impact on all other relevant political perceptions. Naturally Grenadians are curious about the extent to which the foregoing will impact on specific constituencies nationally; however CADRES cautions that this survey was not designed to speak to constituency outcomes. We would however admit that the data collected at the constituency level is consistent with the national trends which at this time point to a change of government. The margin of victory at the national level will however depend largely on the extent to which individual candidates apply themselves over the next three weeks of this campaign.